South Bombay is a commonly used term, but the extent of this district is not commonly agreed upon. This article uses the term to denote the areas of Fort, Colaba, Malabar Hill, Nariman Point, Marine Lines, Kalbadevi, Pydhonie, Mahalaxmi, and Tardeo. South Bombay was the center of terrorist attacks between the evening of Nov. 26th & 29th 2008. The situation is improving but significant damage led to the temporary closure of the Taj Mahal and Trident-Oberoi Hotels. These hotels re-opened on 21st December, 2008. This district contains some of the oldest parts of the city. For a long time, this was the city. One of the seven islands that were joined to form Mumbai was called Bombay. This is where the British started on their long quest to build the docks and the city. They built Fort St. George, which no longer exists, but the area is still called "Fort". The Fort area contains many corporate offices and most of the administrative offices of the city and state governments. Paradoxically, this district contains one of the newest areas of the city, Nariman Point, which was built on land reclaimed between the 1940s and the 70s. This is Bombay's downtown, where the offices of India's topmost corporate houses are located. Malabar Hill, the most affluent residential neighbourhood in the city is also located here. Most industrialists have their bungalows here. This is also where the official residences of Maharashtra's chief minister and Governor are located. The other famous location is Colaba, which used to be an island by itself, until it was connected to Bombay by a causeway. This area contains a naval base. Most of the city's famous landmarks, including the iconic Gateway of India, Taj Mahal Hotel, and Marine Drive (Queen's Necklace) are located here. It has now been given the nickname, and used by most people of the 'Gen Y', of 'SoBo' (SOuth BOmbay). This is the best way to reach South Mumbai whether you have arrived by air, train, or bus. The taxi should be able to get you straight to your hotel. It is also a good way to commute around South Mumbai. All three lines of Mumbai's local train network terminate here. The Central and Harbour lines end at Chattrapati Shivaji Terminus (commonly known by its former name of Victoria Terminus, or VT). The Western line ends at Churchgate, though long-distance trains stop at Mumbai Central. Most tourist areas can be reached most easily from VT and Churchgate stations. The best way to get here from the airport is to make your way to Andheri station and take a southbound train to Churchgate, though this method is not recommended during peak hours, especially if you have luggage. BEST serves this area exceptionally well. During peak times buses have standing room only, but at other times it is a comfortable option. Buses in the series 1-199 serve this area. It is best to avoid bringing your car here, especially on a weekday. While all highways terminate here and traffic discipline is better than almost anywhere else in India, the extraordinary amount of traffic and the near impossibility of finding parking close to your destination make this a bad option to take. Even if you drive down, it is a good idea to park your car at one of the paid parking areas run by the Municipal Corporation (Look for "MCGM" on the streets) and then take other means of transport to your destination. The Gothic facade of the Chhatrapati Shivaji railway terminus, popularly known as VT (Victoria Terminus) station. Elephanta Caves, Elephanta Island, Mumbai . Check out these fine examples of rock sculptures dedicated to Shiva. Even though many of them have been vandalized by Portuguese invaders, their grandeur is hardly diminished. Every year around February, the Elephanta Festival of music and dance takes place on this island in the backdrop of the sculptures. Take a ferry from the Gateway of India. The round trip costs Rs. 180 and will take one hour one way. As of February 2016, access to the caves is Rs 250. Nariman Point — Located at the other end of Marine Drive, Nariman Point is the business hub of Bombay. However, with the change in economic conditions, many companies have shifted to other areas of Bombay like Parel, Worli, Bandra-Kurla Complex, Andheri-Kurla Road, and Powai. The top end hotel The Hilton Tower is located here along with a number of Airlines Offices. Don't miss out the Air-India building. Cuffe Parade is one of the high-end areas where the famous World Trade Centre and Unit Trust of India offices are located. The President Hotel is located here. Navy Nagar/Army cantonment area is located here which is the southernmost boundary of Bombay. Bombay Natural History Society (BNHS), Hornbill House, Shaheed Bhagat Singh Road, Mumbai 400 023 (Located near Prince of Wales museum) +91-22 2282 1811 (fax: +91 22 22837615 [email protected]) . This is a massive source of information for those interested in flora and fauna. Houses collections of beetles and butterflies. There is another floor which has embalmed reptiles, birds, and animal pelts. Crawford market, Bhuleshwar, Chor Bazaar — These are crowded, chaotic markets which are home to some of the really interesting items, including antiques available for very cheap. One has to be prepared to look around though. Esplanade Mansion — Esplanade Mansion, previously known as Watson's hotel, was one of the most posh hotels in the area until Jehangir Tata was refused entry and he went on to build the Taj Mahal Hotel which went on to become the most popular hotel in Mumbai. 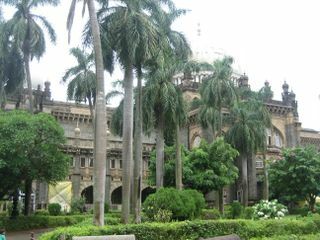 The building is currently in a pathetic condition, due to negligence but has been listed in the "World's 100 Most Endangered Monuments" list and hopefully shall be restored soon. Gateway of India — This was built in 1911 to commemorate the visit of King George V and Queen Mary to India. This arch is the most recognizable symbol of the city. Taj Mahal Hotel . The landmark hotel close to the Gateway of India, along with the Oberoi is one of the oldest five star hotels in India. Flora Fountain — Known as Fountain area which is a prominent hub for commercial activity of Bombay as all the Major banks are located here. You may cash your Traveller's Cheques here. Also country's premier stock exchange Bombay Stock Exchange(BSE) is situated here. This tall building is visible from anywhere in VT/Churchgate and makes a prominent part of the skyline of Bombay. Marine Drive Chowpatty (Local Stn. Marine Lines or Charni Rd) is the city's most famous beach. Situated at one end of Marine Drive, Bombay's most famous promenade. This is not a place to sunbathe, however. Go here to watch the crowds enjoying themselves and have Bhel puri, as a moderately famous Hindi song asks you to. Note that Chowpatty in Marathi means "beach". So you may hear people referring to other beaches suffixed with Chowpatty. (For example, "Juhu Chowpatty"). But if they say "Chowpatty" without qualification, they are referring to this place. Chatrapati Shivaji Terminus (V.T.) — At the other end of Flora Fountain is the Chatrapati Shivaji Terminus, previously known as "Victoria Terminus". It is the disembarking station for Central Railway local trains and long-distance trains. Adjacent to V.T. station is General Post Office, a grand building which is open 24 hours. The road goes further up to Ballard Estate where a lot of Corporate Offices and Mumbai Port is situated. The V.T. station building is a fine piece of architecture. A visit can be booked on working days between 3 pm to 5 pm at CSTM for inner look at its internal architecture. Rajabai Clock Tower, located in Mumbai University, close to Flora Fountain. Similar to the Big Ben of London. Chimes every 15 minutes. Manibhavan (Gandhi Memorial) — The house where Mahatama Gandhi often stayed when he visited the city between 1917-1934. Victoria & Albert Museum — (Bahu Daji Laad Museum). Taraporewala Aquarium — Has an exotic collection of marine and fresh water life. An interesting section demonstrates various stages in the growth of a pearl and also displays exquisite pearl, and mother-of-pearl jewelry. Mumbadevi Temple or Bhuleshwar — Mumbai is named after the goddess Mumbadevi, the patron goddess of the city. The shrine dedicated to Mumbadevi is believed to have been originally built by Koli fisherman in the 1st century B.C. on the site now occupied by Victoria or Chhatrapati Shivaji Terminus. It is now at Bhuleshwar. Tuesday is the main day of worship. Newly married Hindu couples visit the shrine soon after marriage, seeking blessings from the goddess for a happy married life. Mahalaxmi Temple — The temple dedidated to Mahalaxmi, the goddess of wealth and prosperity is one of the most popular shrines of Mumbai. Walkeshwar Temple — Located near Malabar hill. According to legend, Lord Rama came here on his way to Lanka to reclaim his consort Sita, who was kidnapped by the Demon King, Ravana.The temple also has a tank called the Banganga. A quiet place amidst all the bustle. Sri Sri Radha Rasbihari Temple — Located in the lane just opposite the Babulnath temple is the beautiful ISKCON Hare Krishna temple, dedicated to the worship of Sri Sri Radha and Krishna. The temple hall is enchantingly beautiful. One can participate in the regular pujas and sacred Hare Krishna Maha Mantra chanting and hear a philosophy class each morning. Afghan or St. John's Church, Navy nagar, Colaba. St. Thomas Cathedral, near Flora fountain. Tower of Silence. This is where the Parsis practice their famous burial custom of leaving bodies out in the open to be devoured by vultures. However, as the name hints, the site is within a tower where non-Parsis are not welcome, so there is nothing to be seen. There are several other Parsi (Fire) Temples in Mumbai. These are located at Church Gate, Princess Street, New Queen's Rd, Gowalia Tank, and Bandra. The Agiary, located at Fort, was built in 1790 and is considered to be the oldest Parsi temple in Mumbai. Harbour Cruise — If you can afford it, rent the Taj's private yacht (has two sun decks and three bedrooms) for a cruise around the Mumbai harbour, $300/hour (including drinks and meals). Breach Candy, located in the Breach Candy area. Home to Premsons and Amarsons department stores. CR2, located near Nariman Point. One of the newest malls in Mumbai, also houses the INOX multiplex. Colaba Causeway is the street most frequented by tourists. You can buy many pretty trinkets from the street vendors at prices that an Indian would consider exorbitant and a foreigner cheap. Crawford Market, located just ahead of CST. This is one of the most beautiful buildings to look at and is also a famous market to buy everything from fruits and vegetables to imported colas, hookahs, and plastic cups at whole sale rates. Used to be the city's main whole sale market until it was shifted to New Mumbai. Fashion Street, (close to Churchgate suburban station). These are actually street shops lined alongside the road starting from VSNL building. Decent stuff at good prices, bargains for clothes and accessories. Make sure that you negotiate well (prices can come down by as much as 50%). Look around the first few shops and try to estimate the going price. If you decide to walk away (during a negotiation), sometimes the vendor will try to hail you back. Don't go back to the same vendor, he will not discount it to the price you asked and might try to humiliate you. Just walk away, you will find another shop with the same merchandise down the street. Heera Panna, located near the Haji Ali Dargah. It's a popular shopping destination for locals and shops usually deal in imported goods and electronics. Hugo Boss — A Hugo Boss Showroom is in the Hilton Hotel. Kashmir Oriental Carpet Enterprises  One of the finest places where you can get exquisite hand-knotted carpets and rugs from Kashmir with genuine certification of authenticity. This 30-year old store has an amazing range of breath-taking carpets in wool and silk with very reasonable prices and a personalized service. They ship all over the world too - located at 20, The World Trade Centre, Mumbai. Tel: (24-hours) 022-22183284 / 022-22188851. Louis Vuitton — A Louis Vuitton Showroom is in the Taj Mahal Hotel. Manish Market, located ahead of Crawford Market on the other side of JJ flyover. Very famous for its electronic goods, especially cell phones. Shops usually deal in grey goods though. Musafir Khana, located ahead of Crawford Market on the other side of JJ flyover, next to Manish Market. Shops here deal in imported goods and electronics. The Oberoi shopping arcade (in the Oberoi hotel) has a variety of shops offering Indian leather, silks, and handicrafts. Although everything has price tags, at the non-branded leather stores even in the Oberoi don't be afraid to haggle hard (often to 1/2 the asking price), and do not pay more than Rs 1500 for a bag. You can also eat from the various carts and hawkers if you feel your stomach can take it. Yazdani Bakery, Cawasji Patel Road, Kala Ghoda, Fort, Mumbai, Maharashtra 400001, India , +91 22-22870739. Open Mon to Sun 7 AM to 10 PM (Café closed on Sundays, only take-away). Best Bakery in South Mumbai in typical Indian-Style. Great for a Tea and homemade and very tasty Bread, Cake or Cookies. It is a heritage shop set up 150 years ago and the ambience is still like in the old days of Mumbai. 4 INR for a Bread and 35 INR for a Bun Maska. Ayubs, located in a lane near Horniman Circle. Very Similar to Bademiyan. Great Kababs, especially the Tangri Kabab. Open until late and extremely popular among clubbers. It's a street joint and the only place to sit down and eat is your car. Crystal, on Marine Drive. Located at Girgaum Chowpatty opp Wilson College on Marine Drive, Crystal is famous for its Parathas and North Indian fare. The food is very affordable and one will always find a line outside waiting to eat at Crystal. Baghdadi, behind the Taj. Food is a mix of Indian and Mughlai. Don't get put off by its looks, you go there to eat, not for the decor. No booze allowed. Gokul, behind the Taj. It is frequented by anyone who wants an inexpensive drink served quickly. Martin's, Strand, Colaba. Great Goan food. Order a drink quickly before your food is delivered to your table. Not for vegetarians. Bade Miyan, Between Taj & Colaba. Eat on the road or in your car. Open until the early hours of the morning. The rolls are a favourite after a movie. Kailash Parbat, Colaba Causeway. This is a basic restaurant, serving excellent vegetarian Indian food. Samovar, inside Jehangir Art Gallery, Kala Ghoda near Colaba Causeway. A favourite with the Bombay art community, serving vegetarian and non-vegetarian Indian food. Pancham Puriwala, Road opposite GPO/ VS or CST station - corner building. Serve the best Puris as the same implies with some side dishes. Not the greatest in ambience, but a very good hole-in-the-wall restraunt around here]. Chetana Vegetarian Restaurant, Kala Ghoda, K Dubash Marg,+91 22 2288 1159, . A great Gujarati and Rajasthani food restaurant. Service is OK, atmosphere decent. They also serve cocktails and beer. Rs. 450 ($10) for two. Gallops, Mahalaxmi Race Course, Mumbai (first entrance of the Mahalaxmi Race Course while coming from Haji Ali). Continental and Indian food restaurant. It's expensive, but worth it for the ambiance, service, and food. Suzette, at Atlanta Building in Nariman Point, is an authentic French Creperie famous for delicious Crepes and snacks. Rajdhani, near Crawford market serves excellent unlimited thalis. Strictly vegetarian. It has been rated one of the best places to eat in Bombay. Rs. 250. Ling's Pavilion, behind Regal Cinema in Colaba, serves some of the best delicious authentic Chinese food in Mumbai. Bhagat Tara Chand, Kalbadevi. Great Indian Curry and 'home food'. Must visit for Indian food lovers, but you have to walk a bit. Cafe Leopold, Colaba Causeway. Mumbai landmark, and badly damaged in the 26/11 terrorist attack. This place requires no introduction and is a favorite with travellers and locals alike. Serves a mix of Indian, Chinese, Persian, and Continental Food. Also serves great breakfast round the clock; it is renowned for fresh fruit juices. Cafe Mondegar Colaba Causeway, has a live jukebox and functions as a bar (beer and wine served) and restaurant. Food is a mix of Indian, Continental and Parsi, and the ambience is fun and low-key. Cafe Basilico, Colaba, off Colaba Causeway, near Strand cinema +91 22 5634 5670. This is not a budget restaurant, but it's not expensive either. Very popular with expats who live in the city. Offers non-alcoholic drinks and coolers, Mediterranean-inspired food, and great dessert. Open all day. The rawas (local kind of fish) and the cheesecake is recommended. Indigo Deli, Colaba, off Colaba Causeway, on the way to Gateway of India. Excellent food by the Indigo people at cheaper-than-Indigo prices. Very popular with locals and expats for lunch and brunch on all days, so there can be quite a wait. Cafe Mocha, Churchgate. It is a relaxed Sheesha restaurant serving heavy snacks. Very popular for dessert and coffee. Thrishna, Kala Ghoda. It's famous for its seafood and patronized by locals, as well as expats. Jazz by the Bay, on the junction of Churchgate Road and Marine Drive. Serves a popular soup and salad buffet lunch. In the evening has live gigs and is a popular bar and restaurant. British jockey Martin Dwyer described this bar as a "smashing little place" in a conversation with fellow jockey Paul Mulrennan. Royal China, Sterling near VT. Good Chinese food and a special Dim-sum menu. Paradise, located on Colaba Causeway. Paradise serves Parsi food and is extremely popular amongst locals, especially those who have been eating here since they were kids. The place has been recently renovated, though the charm still remains. The place is family owned and one must try the chicken steak, the chicken dhansak, and a really nice chicken salad. Gable's, located on Colaba Causeway.Restaurant that serves good array of goan food besides delicious Leg of Ham,Pork Chops and Steaks. Frequented by travellers, has a good british breakfast of ham,sausage,eggs and bacon. Cafe Churchill, located on Colaba Causeway. Serves mostly continental food in a very cramped location. The food is pretty good, especially the pastas. The desserts here are the best and one should not miss the Irish Baileys Chocolate Cake, which is highly recommended. Keep in mind though that they don't have a restroom. Cafe Royal/CR, located across from the Regal Cinema. Bill Clinton chose to eat here on his visit to India. Famous for sizzlers and other continental food. It now goes by the name CR after being renovated. Fountain Sizzlers, located near Flora Fountain. As the name suggests, it is famous for its sizzlers, especially among the office crowd. Pizzeria, on the Corner of Marine Drive and VN road - great pizza in lively surroundings. Come early or be prepared to wait for a table! Moshe's, Cuffe Parade. Mediterranean food. Extremely popular with locals, and a good, classy mid-range option. Indigo, located in a bylane of Colaba behind the Taj hotel. This is an upscale restaurant serving global food. It also has a bar that gets lively after 9PM. Fantastic Sunday brunch (food+drinks+live music) at about Rs 2000. Khyber, Kala Ghoda. Nice Indian food at steep prices. Lings Pavillion, Colaba behind Taj Hotel. High-end Chinese. The Dome, Hotel Intercontinental, Marine Drive. It is an open air bar and snack restaurant with a beautiful view of Bombay. Golden Dragon, Hotel Taj Mahal, Colaba. The upscale Chinese choice for locals and expats. Wasabi, Hotel Taj Mahal, Colaba. Brand new Japanese restaurant. Recently re-opened after the 26/11 attacks, with a new, improved menu and a Nobu Chef. Frangipani, The Oberoi, Marine Drive. 24 hour restaurant. Popular for post-clubbing coffees with the posh set. They serve fantastic thin-crust pizzas, along with some local specialties. Excellent breakfast and brunch. Trattoria, Taj President, Cuffe Parade. 24 hour coffee shop. Excellent pizzas. Can get extremely crowded on Sundays. Thai Pavillion, The Taj President, Cuffe Parade near Colaba. The only legitimate Thai restaurant in the city. Tendulkar's, located in Colaba, near the Royal Bombay Yatch Club. Cricket player Sachin Tendulkar's restaurant. A mix of continental and Indian cuisine including Sachin's favourite dishes. If you know someone who is a member of the Willingdon, Bombay Gym, Radio club, or CCI beg them to take you there for cheap, good food, and dirt-cheap drinks. Tetsuma. The bar and restaurant is pretty and has some nice cocktails. A great place to pre-drink before heading off to Prive, the only good nightclub in (south) Bombay. Dome in the Intercontinental Hotel provides a great view of Marine Drive, and has a fantastic ambience. Prices as to be expected at a hotel bar. The Bayview Bar, located at the lobby level of The Oberoi. Mumbai has an arresting view of the Arabian Sea and the finest range of single malts and Habanos cigars. “George and Soft Rock Revolution” perform at the bar and sooth you with their charming renditions of Jazz Classics. Open from 5PM-1AM. Tel +91 22 6632 6220. Opium Den, at Hilton Towers Mumbai. Serves a vast array of martinis, daiquiris, and home infused vodkas. Quiet and convenient, this bar is a break from the ordinary. Open: 12:30PM-1:30AM Tel +91 22 6632 4343. Indigo — An exclusive lounge and bar located at Colaba causeway behind Hotel Taj Mahal in South Mumbai is a not to miss destination. +91 22 56368980. On the expensive side with an average drink costing Rs. 250 upwards. Boasts of a large wine collection and also serves superb fusion food. Excellent alcoholic Sunday brunch. The Ghetto (near Mahalaxmi temple) is pretty good and has its usual media/arts college crowd and is completely filled with ultraviolet light. Tavern at Hotel Fariyas in Colaba shows music videos and is pretty packed, but don't go there if you don't like Linkin Park, etc. Hotel Rosewood, Tulsiwadi opp. A/C Market, Tardeo, Mumbai 400 034 (Nearest landmark is Crossroads Mall, M M Malviya Road. You have to turn left at a little lane a couple of blocks down from Crossroads. ), +91 22 2494 0320-29, +91 22 2496 0318, +91 22 2498 3568-69 ([email protected], fax: +91 22 2498 3567). The location is somewhat inconvenient, but has a good restaurant called Oh! Calcutta. Rs.1750-4500 (exclusive of tax). Bombay Luxury Apartments, Colaba causeway. Rent entire flats priced at Rs. 7000 upward. url="http://wwww.digi-rentals.com/mumbai-south" +91 22 22845004. Hotel Moti International 10 Best Marg, off of Colaba Causeway. Clean, safe and quiet. Taj Mahal Hotel  — The Taj Mahal Hotel and Palace was one of the first five star hotels in Asia and was built by Jamshetji N Tata, (the founder of one of India's largest business empires, the Tata group) as he was refused entry into Watsons Hotel. It also consists of a newer wing. This is by far one of the most beautiful hotels in the world and one must at least see it, even if it's a bit too pricey to stay in. The Taj Mahal was badly damaged by a terrorist attack in November 2008; the hotel partially reopened on December 21, and complete renovation was completed in 2010. Oberoi Towers, Nariman Point 22024343, 22025757. Vivanta by Taj President Cuffe Parade. Nice quiet area, with some great restaurants and bars in the hotel. This page was last edited on 12 December 2018, at 15:13.